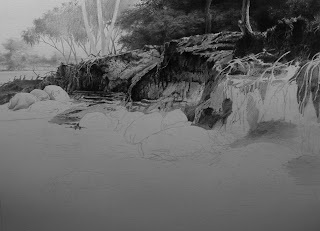 Now to the tedium, well not really tedium but the slow going of the water, my very favorite texture to do! (NOT) But then again, it's always fun to take on a challenge . . . how else does one learn if not by challenges and pushing limits? Also now, the slow going of building up the layers of shadow and picking out little details to move the eye around the work. The end is in sight! Getting a late start in the studio today, having run around this morning taking care of all that needed taking care of since I had not been out the front door for the last five days, feeling as lousy as I had. Now, before I dig into work today, wanted to post what had been accomplished yesterday in a couple of hours that I managed to sit at the drawing board, since I am now beginning to feel human again. 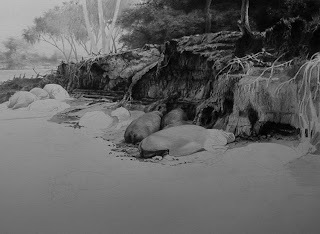 Finished up several of the beasts as well as added some darks, played in the water and now, determined to get this one done in the next few days. Let's see if I can live up to my determination! 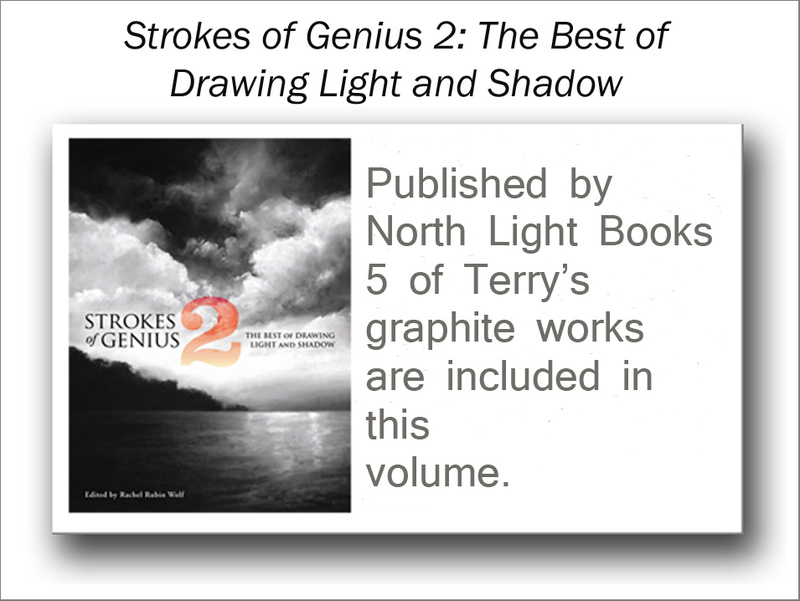 Sooner than I expected, my shipment of the newly published, Strokes of Genius 2: The Best of Drawing Light and Shadow, has arrived. 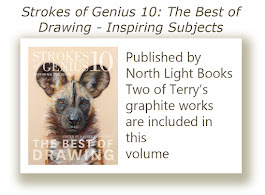 Five of my works are included in the book, which showcases 140 works by 100 artists from across the globe. 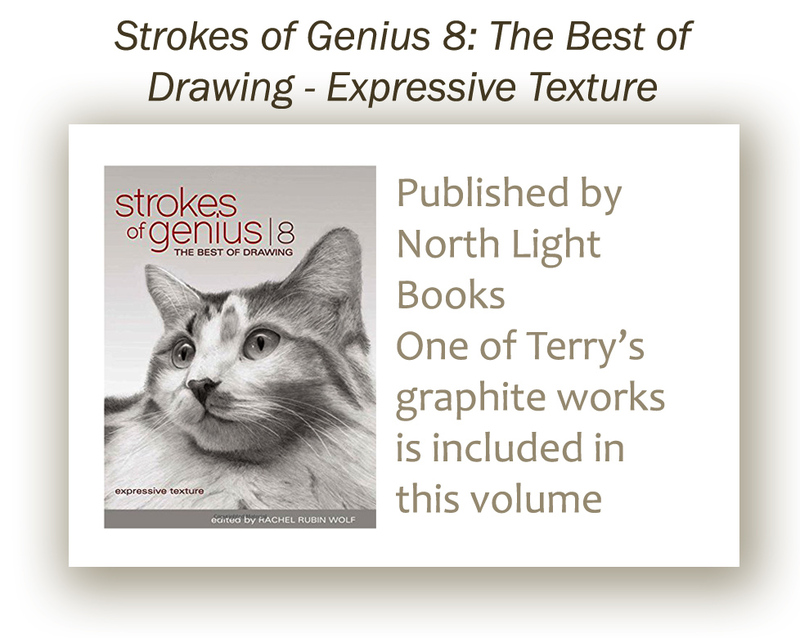 In addition to graphite works, many other mediums are featured which makes the volume completely compelling in all sorts of creative ways. 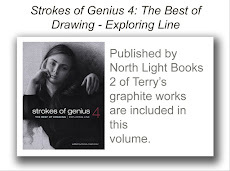 Autographed copies are now available directly from my studio at $32 each, which includes the cost of mailing in the continental US, $40 to Canada. Please inquire about additional shipping costs, if any, outside of North America. 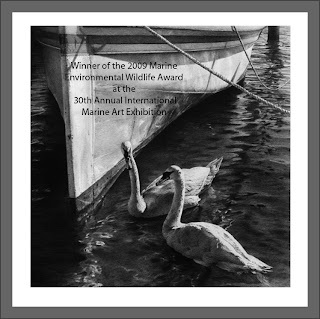 Word has just come in that my work, On the Wings of Spring, won this year's 'Marine Environmental Wildlife Award' at the opening of the 30th Annual International Marine Art Exhibition at the Maritime Gallery in Mystic, Connecticut this past weekend. I am thrilled also to here that the work sold. Here is a link to the opening page of the entire exhibition. Sorry I've been 'off' for the last couple of days, this cold/flu has kept me off my feet and away from the drawing board. I think the same will hold true for today as well, but wanted to respond to a question from my last posting in mid week. 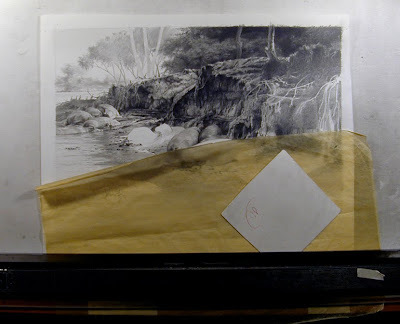 Here is an image, just shot, of my work in progress showing my slip sheet, or an old piece of tracing paper that I use often when a work gets rather heavy with graphite, to cover portions of the work and protect from smearing etc. Also, you will note a small square of scrap bristol that I use as a heel guard on a regular basis while working on a piece. This little square moves with my hand as I work on one part of the piece or another, resting the heel of my drawing hand upon it. 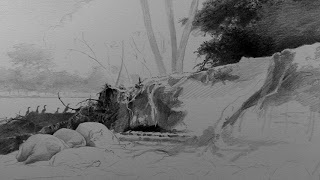 Also, as I have mentioned before, I do use light and frequent sprays of workable fix (Krylon) on an area that has been pretty well worked up to close to conclusion just to set loose graphite - this especially in areas where there are many layers of ever darker and softer graphite - as in this particular work on that dark, shadowy river bank and also in the deeply shadowed trees at the upper part of the composition. As the image shows now, the slip sheet is positioned over the lower part of the work to protect it as I continue (when I do get back to work!) 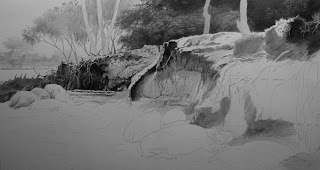 to work the middle part of the composition and also to keep from smearing what parts of the water that I have already begun to set in. I have not yet applied any fix to the lower part of the work, as I want to be able to continue to build up darks in the water, so the slip sheet, as it is positioned now, protects all of that. At times, depending on where I am working on the piece, the slip sheet will be positioned in a more vertical manner, covering one half or other of the work, as I work across from side to side, setting in darks or adding details. This work is slightly less than 12" x 16" and will wind up floating in its frame without matting. I will show it, when complete, in its frame. And now, time for tea with honey and rest . . . Feeling a bit on the puny side today so not sure I will get in a substantial amount of studio time to post an update on the current work. 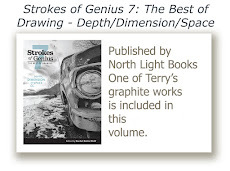 But, in the meantime, I wanted to note today that Strokes of Genius 2: The Best of Drawing Light and Shadow will be available very soon. I have ordered a good inventory to have available to sign and sell directly and will post cost and additional information in the next couple of weeks, so if you are interested in obtaining an autographed copy, please let me know and I will hold one aside for you. Also, I want to take this time to crow a bit, again, about my 2008 published book, Unknown Bridges, from last year's well received solo exhibition at the Woodson Art Museum. 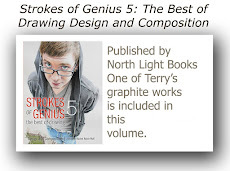 The complete book is now available for preview at the Blurb website, here. 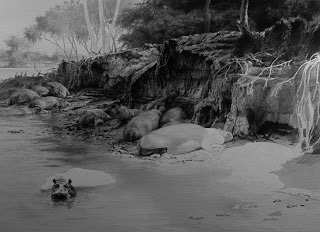 Busy weekend, so not a lot accomplished but have a hippo or two done now and continuing to noodle that eroded river bank . . . what fun! Actually, it is a great deal of 'fun' and I have felt some of that old feeling of joy about doing something African in nature again. And the slices keep coming . . . slow process now . . . building up all those layers . 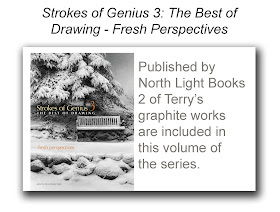 . . giving depth to the work . . . moving things forward and back . . . placing well defined details - just enough of them to keep it interesting . 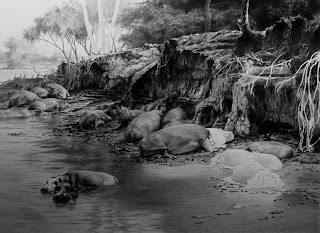 . . and doing my usual over-layering using ever softer grades of graphite to intensify the shadows, so far B being the softest I've gone. As I said before I started this piece the other day, it has been quite some time since I have undertaken to do a relatively involved African subject matter work. I am feeling rather positive about this one, so far. Perhaps this one will turn out to be the catalyst that will help to dredge up all those long neglected African 'songs'. Another slice today . . .
A slice of life . . . or at least a slice of the life that will be mine for the next week or more . . . Funny thing - Inspiration. It can take on many diverse forms; it can come from the oddest of places; it can leap out and surprise you at the strangest times; it can elude you when you are in most need of it; it can bring you to your knees or it can sweep you off your feet; it can turn your emotions upside down. In short, inspiration can be a hard thing to grab hold of and once grabbed, can be a hard thing to hold on to. 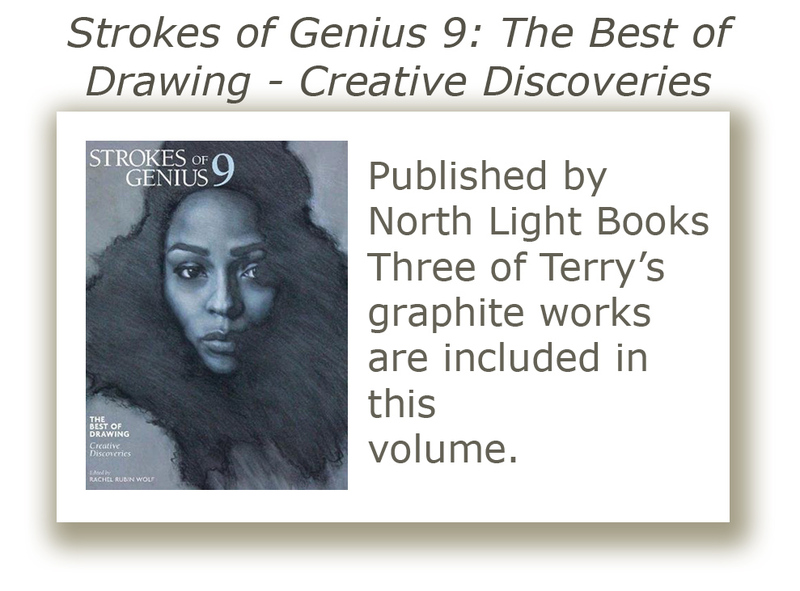 As an artist, inspiration can be the basis for being able to move ahead with an ongoing work or to be able to begin a new project. Sometimes, the doldrums hit and inspiration is nowhere to be found. Sometimes, inspiration can be overwhelming and you need to step back and pull yourself out of a tangle of competing ideas and concepts. For me, inspiration creeps into my field of vision from all sorts of hiding places - a piece of music that sets my emotions to churning, boiling or deep thought; a sudden discovery of something or someplace new to explore; a color, cast shadow, sparkle of light, overlay of textures; a sound or smell that grabs up a long dormant memory from deep down in my bones. And when inspiration hits like a bolt out of the blue, I need to stop and make myself aware of it all, take notes, sketch, photograph, grab the moment in my mind's eye and file it away. You never know when inspiration will lead you off on a wonderful run and you can't afford to pass it by. So, when I am on a self-imposed deadline like I am now, for getting out new work for fall showings, I seek inspiration and hope it will poke its head out, crook its little finger and beckon to me. For some time now, I have had it in mind to do a number of works based upon African themes as it has been a rather long time since I have had any major African works come off the drawing board. Living in Maryland, as I have for the past 8 years, inspiration has come from many surprising places that I would never have dreamt it would, ten years ago. So, horses, sheep, cows, barns, rural landscapes and much more have become predominant subjects in my compositions and thoughts. It is simply a fact, I feel, that whatever presents itself as inspiration at any given time, is what becomes the focus of one's work. The 'present-sy' of things is how I view it. What you see and experience in the here and now is what you deal with in a creative flow. It's a natural thing to become more focused on what is current in mind, as things that once were inspirational and current in days gone by tend to recede into haze and lose their focus. I can not say that I like that things that once were right there at the front of my head, fully in focus and begging to be worked up into drawings, have begun to fade and lose their luster as time has passed. Every so often, I will open a special drawer in my studio, a drawer in which the mists of time and the haze of passing days has begun to chip away at ideas that were sketched out, sometimes years before, and that were once so potent in my creative eye that I just knew they would be wonderful things to work on and complete. At a time like now, when I am figuring out what I want to be working on over these next two months toward a major showing in mid November, needing somewhere in the neighborhood of 15 to 18 new works, I go to that drawer and hope that by reviewing scraps of paper, notations, fully fledged sketched out compositions and such that inspiration will crawl out of the haze. This past weekend was the opening of this year's edition of Birds in Art at the Woodson Museum in Wisconsin. Even though I have a work included in the exhibition this year, I did not attend the opening reception as I have for the last many years. I have always found great inspiration during the three days in Wausau, viewing the work of fellow artists, many of whom I know personally and many who I only get to spend time with this one weekend a year. I never fail to return home greatly inspired by all the wonderful and creative artwork that I am immersed in there. 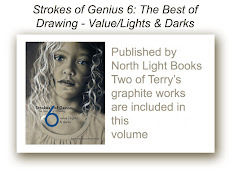 This year, I have had to content myself by vicariously enjoying the exhibition by way of reviewing the catalog, which arrived yesterday, and by relishing the comments of artist friends who attended. It's not the same. Sitting and enjoying lunch this past Sunday with artist friends, including Matthew Hillier who I don't get to see as often as I would like now that he and wife, Julia Rogers have settled on the eastern shore of Maryland (a good two plus hour drive from my studio now), the conversation turned, as it would naturally because of the specialness of this particular weekend in September, to Birds in Art. Matthew too, has a work in this year's exhibition but did not attend either as he was just back from gathering reference material and doing field study at Yellowstone. With their move across the Chesapeake Bay, both Matthew and Julia have begun taking great advantage of the 'present-sy' of their new location right on the water. Both have begun to paint boats and the water that surrounds them and both have done some stunning pieces. 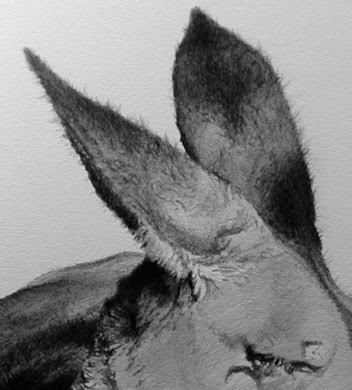 It is obvious to me as a friend and should be to others familiar with their animal art, the inspiration that has now begun to permeate a lot of their studio time, comes directly from what they see every day in their own front yard. 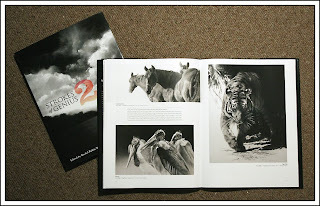 Matthew talked at length about how he felt he might need to reinspire himself to bring more animal subject works into his frame of view in the studio. I spoke of my desire to rekindle the emotions that always, in the past, have sparked great joy in working up ideas based upon my seven trips to Africa. We both agreed that the immediacy of the present and of what surrounds us as artists today, will always take center stage, but that the ideas and places and memories which we have found so inspirational in the past will too, remain within us and with a little nudge now and again, be brought to the forefront in our creative pursuits. I am about to begin a new work based upon hours spent yesterday, digging through photos and notes from time in Africa. I hope that these first, tentative steps will encourage that, to now, illusive friend, Inspiration, to reopen my eyes to the wonder that has, in the past, brought me such joy in focusing on that great continent. To the final heartrending chords, as Birgit Nilsson hurls herself off the Castel Sant Angelo in Puccini's masterpiece, Tosca, I have, this afternoon, penciled the final strokes to this work. What a climax! Image size on this one - just shy of 9" x 20". Part 'the third' today, now, rapidly becoming a fun exercise in textural contrasts as well as light and shadow. As I have often mentioned here, those of us who work in monochrome mediums tend to rely heavily on contrast, compositional interest and textural variation to 'get the point across'. With a relatively spare canvas here, the nuances of the ground indications are really going to make or break this one. As in the recently completed large work that is about to be shipped off to Bennington, Vermont for their upcoming Impressions of New England show, in which the foreground rocks played such a major part in the overall composition of that piece, defining the majority of the space with a viably recognized textural pattern, in that case rocks and in this case dirt/sand/pebbles, is of great importance, not to mention a great deal of fun for this artist! The new work - part 2. The fall crop of shows looms large on the horizon at this time of year and in response there will be long days and probably long nights in the studio as well, preparing for several upcoming major showings over the course of the next four months. With that in mind, here I go! Keep your ears peeled! Fuzzy stuff here.